The first silver Panda coins—issued in 1983, 1984 and 1985—were Proof quality, with a precious metal content of 27 gm. of .900 fine silver, and a diameter of 38.6 mm. Mintages were only 10,000 for each year. No silver Pandas were issued in 1986. 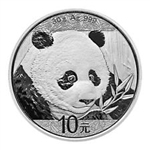 The 1987 silver Panda coins were minted in Proof quality from 1 troy oz. of sterling (.925 fine) silver, with a diameter of 40 mm.